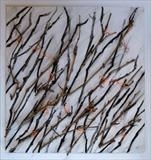 Tangled thickets of winter branches, drawn, cut and wrapped with meticulous care highlight growing points and resilience. The energy of plant growth fascinates me and the power of pruning to direct growth by removing old wood to stimulate buds into new growth always amazes. These "drawings" use meticulous tread wrapping of complex forms to highlight and celebrate tenacious growth and determination.